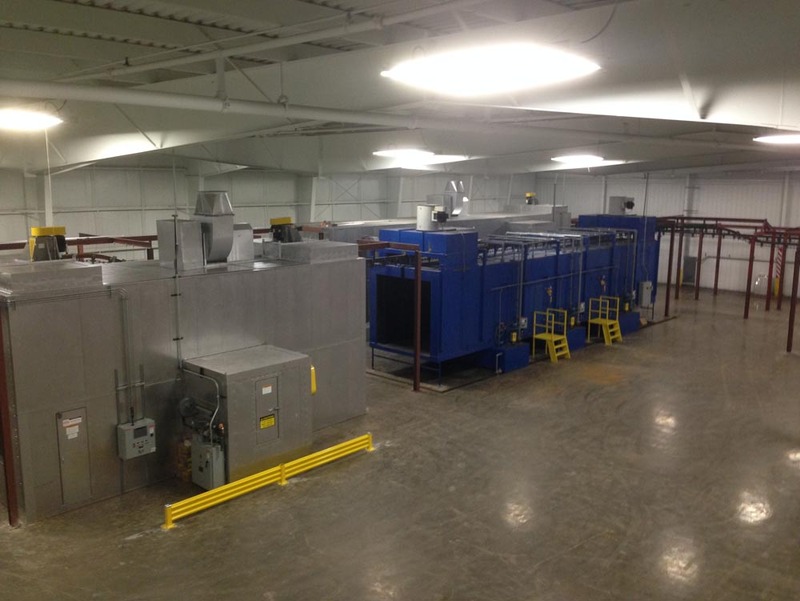 An industrial pre-treatment wash booth is used for cleaning and preparing materials prior to applying the powder or liquid coating finishes. 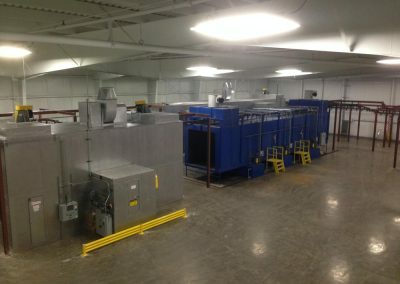 An industrial wash booth is typically used before or after the parts of the machine are manufactured. 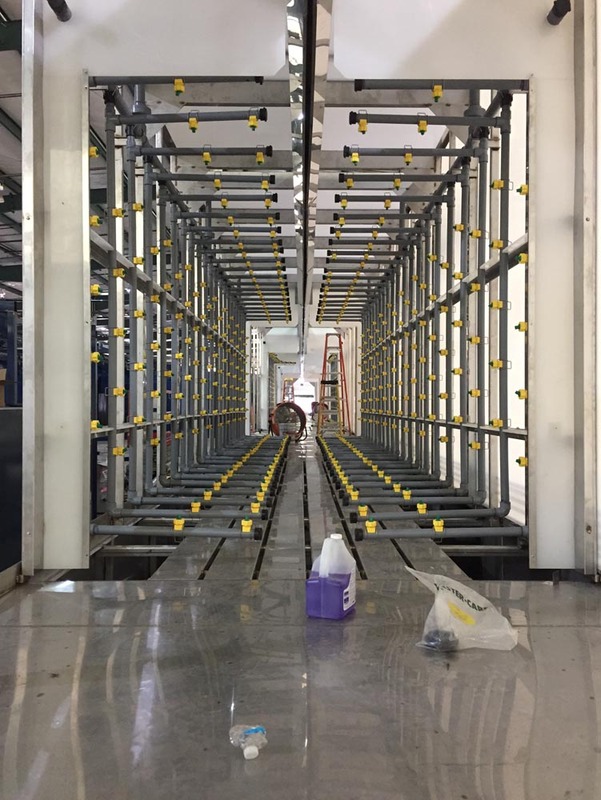 Parts requiring superior corrosion protection, such as automotive parts, wheels, appliances and office furniture often require multiple washer stages. 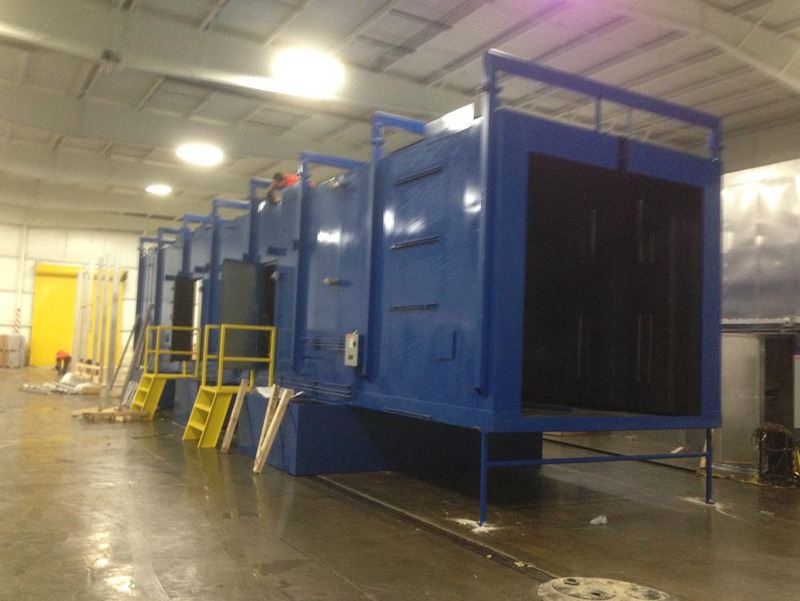 There are many different types of industrial wash booths and pre-treatment areas. To determine which is best solution for your process please gives us a call at 800-637-4027. All heated tanks will be equipped with submerged gas fired tube heat exchangers mounted in the solution tank for sufficient capacity and arrangement to provide the necessary BTU input. Burner capacity supplied will be consistent with solution temperature, spray volume and work weight per hr. The heat exchangers will be constructed of #10 galvanized stainless steel and welded for water tight service. Gas fired systems will be heated with AH or TAH modulating burners with automatic electrically ignited pilots with ECLIPSE flame safety. Burners will be provided with DUNGS, dual automatic safety valves. Temperature control will be a Honeywell UDC indicating modulating controller. The heating system will be protected with air flow and gas pressure switches that are required by FM Regulations Volume 6-9 and NFPA 86. Each heated tank will be exhausted by an insulated exhaust duct that will run vertically to the building exterior. 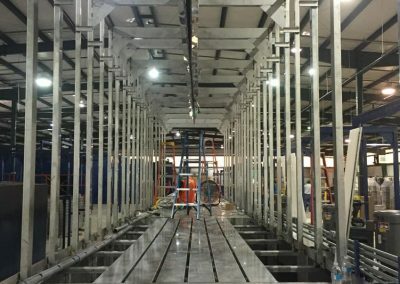 The washer unit will be furnished completely assembled up to the top of the tank and piped and wired to a single point connection for each utility. 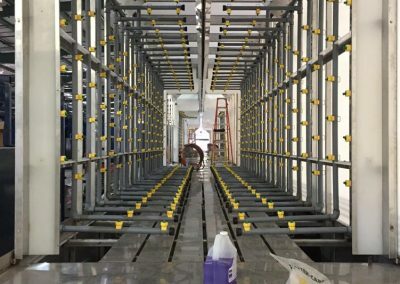 The spray housing, framework, and spray pipe assemblies will be furnished and knocked down for installation on the field site. The washer canopy will require field seam welding. One completely wired NEMA 12 control panel will be furnished with the washer unit to be mounted on the unit at the desired location. All switches will be provided with 19,000-hour life LED illumination. The control panel will be furnished with all necessary main disconnects, motor starters, push buttons, fuse cutouts, safety controls, indicating lights and switches. Tanks for non-corrosive service will be fabricated from 3/16” stainless steel plate by welding. The tank floors will be sloped to drains. Each tank will be sized to the length and width of the spray stage served with a sump extension at one side to accommodate pumps, dual stainless steel pump screens, CPVC drain, overflow and chemical servicing. The washer unit will be mounted on a 4”h front and 6”h rear tube base for construction of the unit and to provide rails to move the equipment onto the field site. Tank capacities for all stages will be based on the volume of approximately 3 times the GPM sprayed for each stage. Drain pans will be from 12ga. stainless steel from the entrance vestibule to Stage #2 and from 12ga. stainless steel from Stage #2 to the exit vestibule. The drain pans and the solution tanks form the bottom of the spray booth. 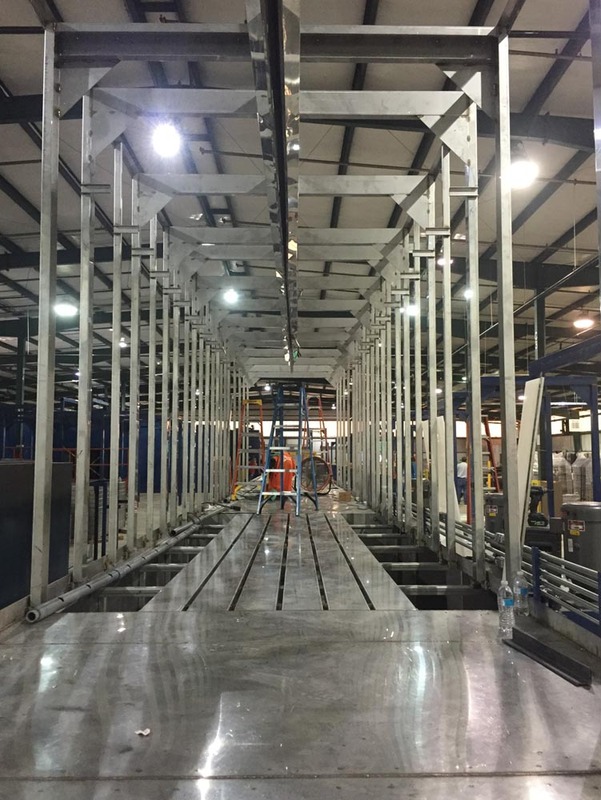 Sides of booth will be sealed to tanks and drain pans with internal lap to provide rigid unit construction and ease of field assembly or modification. There will be inter-stage baffles at the entrance and exit of each spray zone. Stainless steel access doors that are inset and internal drained will be furnished in each drain area except for the entrance and exit vestibule. The spray system will consist of recirculation centrifugal pump, connecting piping, spray manifolds, valve, pressure gauge and spray nozzles. Pumps will be Gusher stainless steel that is a vertical extended-shaft sump-mounted centrifugal type for all cleaning, iron phosphating or chromic acid applications. All standard piping will be of extra heavy SCH80 CPVC construction. 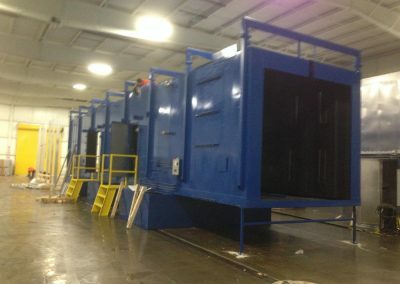 Our factory trained installation crew can get your new Industrial Pre-Treatment Wash Booth installed correctly and quickly.